Energy Development and Wildlife Conservation in Western North America offers a road map for securing our energy future while safeguarding our heritage. The final section calls for a shift away from site-level management that has failed to mitigate cumulative impacts on wildlife populations toward broad-scale planning and implementation of conservation in priority landscapes. The book concludes by identifying ways that decision makers can remove roadblocks to conservation, and provides a blueprint for implementing conservation plans. 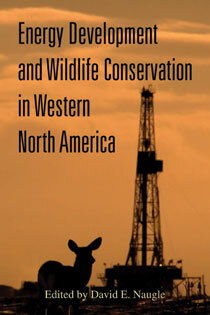 Energy Development and Wildlife Conservation in Western North America is a must-have volume for elected officials, industry representatives, natural resource managers, conservation groups, and the public seeking to promote energy independence while at the same time protecting wildlife. "This book provides a vision for landscape conservation to safeguard our wildlife heritage while securing our energy future. Trade-offs between energy development and conservation are unfolding before our eyes—and the intention of this book is to help policy makers turn science into solutions to this most pressing issue. This book speaks to a philosophy of science-based conservation that first seeks to understand how a system works and then to use that knowledge to help provide solutions." "Dave Naugle, and twenty-three experts, have done yeoman's work in addressing interrelationships between energy development and wildlife. The arena they describe is growin rapidly in significance. This important book provides the sorely needed platform upon which to construct research and management programs and guide inevitable debates." "An insatiable appetite for energy could be devastating to our continent's irreplaceable wildlife. Energy Development and Wildlife Conservation in Western North America is a timely and welcome addition to the scientific literature. Many relevant issues are covered by expert contributors, including the potential negative impacts of so-called green energy—wind, biofuels, and solar power—on wildlife. A must-read for all those concerned with wildlife conservation." "The articles have a strong technical foundation, but they're well written and understandable for anyone with an interest in the subject...An interesting book, offering dependable information on one of the West's most intransigent controversies." "I am hopeful: the book abounds with promising hints of pragmatic mergers between research and results. And that is why this latest amalgamation of population and conservation studies, while academic and dense, bodes well for the overdue convergence of science and society in conserving our remaining open spaces and wildlife communities in the west." "In Energy Development and Wildlife Conservation in Western North America, editor David Naugle presents not only a thorough assessment of the impacts and risks of energy development but also—more importantly—a roadmap of how the biological sciences community can address these risks." "Conservation success requires the implementation of the scientific tools necessary to protect wildlife in the face of energy development, and the final chapters of this book on policy- and community-based conservation suggest ways to do this....The authors herald, 'With one resounding voice, the conservation community needs to indicate which landscapes are most valuable to wildlife if they expect their interests to be heard. To date, we have no such game plan' (p. 229). This book presents the outlines of such a plan. Will society use it to protect our wildlife?" "...this volume presents excellent summaries and suggestions for large-scale planning of energy development to ensure that viable wildlife populations are maintained for future generations."